Media and Contents: 80 pages of text. B&W photos, approx. 92 profiles (10 of which are three view), illustrated page of RA fighter and assault unit emblems, and RA fighter unit structure. Advantages: Italian and English text, well written and well illustrated. Recommendation: Highly Recommended, especially to Regia Aeronautica enthusiasts. As many of you know, I enjoy delving into the minor air forces and aircraft of the Second World War, including the Reagia Aeronautica. For those of you who share my enjoyment, this book will be a welcome addition to your reference library. It is written in Italian and English (parallel columns and dual captions), and the English translation is quite well done. 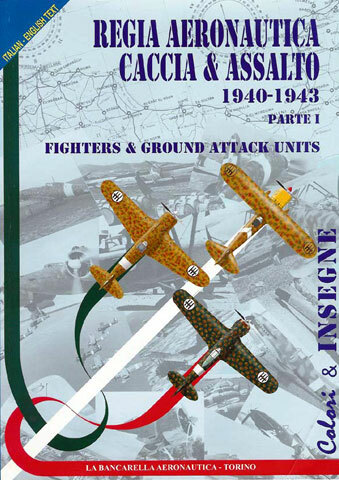 In English, the full title is “Camouflage and Markings of the Regia Aeronatica Fighter and Ground Attack Units 1940 – 1943 Part One” and this book delivers on that title. 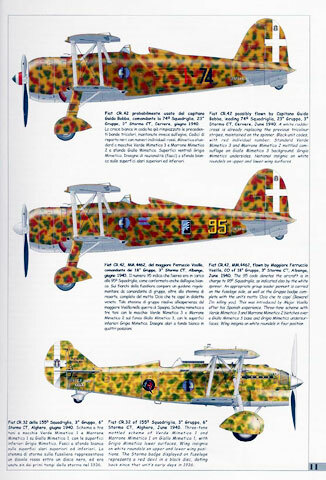 The book opens with a short overview of RA camouflage styles and colors and national markings during this period. Not to give away the punch line right away, but we learn that a single aircraft could have as many as 18 fasces on it! We also learn that prior to 1941 there was no organized systems of colors and camouflage application. Color and style of camouflage depended primarily on which paint company supplied the paint to which manufacturer. The authors then proceed to discuss the development (or lack there of) of camouflage and markings in different theatres of war beginning with the War on France. They continue with the Channel Front, Malta and the Mediterranean, Greece, North Africa and conclude with East Africa. We learn that the white fuselage band was not so much an identification of aircraft assigned to a theater of operation, but rather a way to prevent RA aircraft from being shot down by German aircraft. A Fiat Cr. 42 was often mistaken for a Gladiator! Finally, the authors conclude with a discussion of the colors used during the period. They make a good attempt to correlate the colors to an FS approximation and to Humbrol paints. The book is full of well illustrated profiles. In my opinion, they are some of the best color representations of RA camouflage that have been printed. The aircraft represented are primarily the Fiat Cr. 32, 42 and G50, which formed the core of the RA during this period. In conclusion, for those who enjoy researching and modeling the RA, and who do not read Italian, this book is as important as Paul Lucas’s Camouflage and Markings: the Battle for Britain is to those who model the RAF. I recommend this book highly. I also want to drag out that old Classic Airframes Cr.42 so I can do it with the green, white and red rudder stripes!